2016 is a very interesting year for color. If you came across our previous article, How to wear pink, we mentioned that Pantone had selected two colors for the year-Rose quartz (an earthy,light pink) and Serenity (a pale blue). Earlier I showed you how to wear pink, now let’s explore the exciting options with blue. Serenity conveys exactly what the name implies, a calm and easy blue that is flattering on every skin tone. It is also extremely versatile and closely related to pastel blue. The beauty of this shade, is its timeless quality. If you invest in the right pieces in this shade, you can wear them season after season. 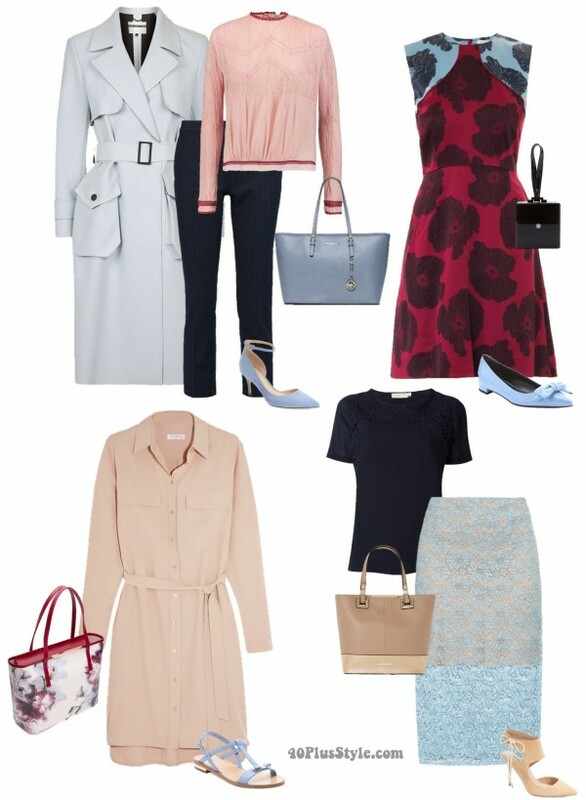 Here are a few quick tips for wearing pale blue. Create a chic look by pairing a pale blue piece with either a more subdued (yet contrasting) color, or a bold color. In this instance the pale blue works as a neutral, which helps bring out the full strength of whichever contrasting color you choose. We particularly like the juxtaposition between the pale blue sweater and a reddish hue (such as the Chloe pants below). Adding a neutral tone to your pale blue item will help give the ensemble a bit more of a foundation and give it a fresh and crip look (especially when paired with white). Select quality fabrics when going with a neutral pairing, as quality material and tailoring will create a cleaner and more luxe outfit. A pale blue monochromatic ensemble will create both a soft and striking look. The key to keep it from being too soft (or Easter like), is to add contrasting accessories that add a little edge. Slight variations in shade (such as with the top and trouser pairing below) create the same elongating look but keep it from looking too much like a uniform. As always, accessories are the best way to go if you want to highlight your outfit with a select color. In this instance, the pale blue hue can work to soften an edgy or dark look. It can also serve as a low key contrast, which gives you a visually appealing look without being too jarring. I really liked the diversity of hues in the Mr&MrsG palette, so opted to play around with these spring shades, which are both transitional and contrast elegantly. The the more somber tones at both ends of the spectrum (deep burgundy and navy blue) contrast perfectly with the lighter shades from the same color family (light pink and pale blue). The more neutral tone in the center provides a great foundation to experiment with various color combinations. Here are four looks inspired by the Mr&MrsG color palette. 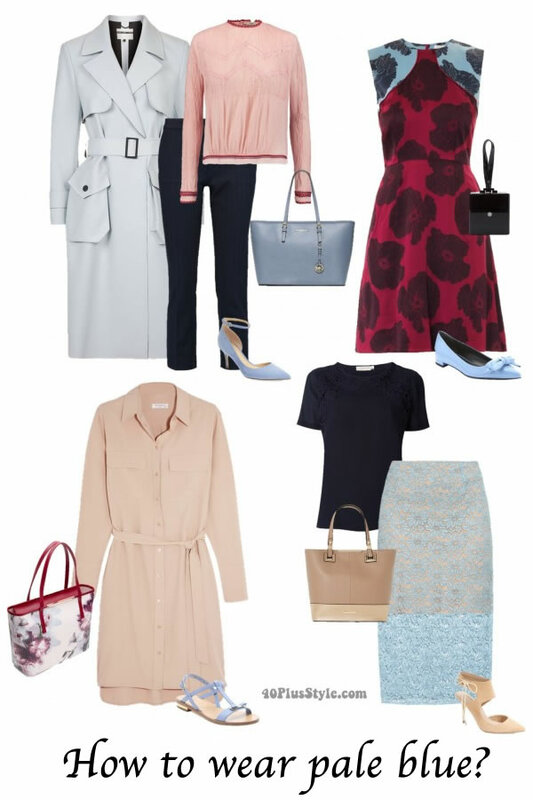 How do you plan on wearing pale blue this season? you give the best tips!!! 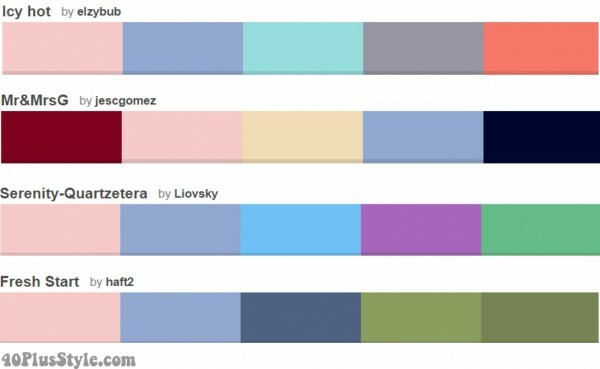 Thank you so much for the color palettes Sylvia! I just bought a serenity blue cross body bag and would like to add a scarf or belt to style with things from my closet. Blue nail color is also speaking to me! I am going to skip this colour all together. Not my colour. And I don’t even like it enough (on me) to buy a skirt or a bag or trousers in that blue. Next post: Colorful and beautiful style from the 2016 Easter Parade! Which is your favorite look?